Kotor, Budva, and Tivat are the most-visited cities to the north of Montenegro, and for some reason, so many people skip one of Montenegro’s most amazing towns: Herceg Novi. This fantastic town is located right next to the Croatian border, just 11.5 km away. Our home base for a month was in Igalo, a smaller town that’s a part of the Herceg Novi Municipality and is only 20 minutes away from the city of Herceg Novi. Given how close both cities were to each other, and the beautiful walk that connects them, we visited Herceg Novi quite a few times. Here are a couple of the things we’d like to share with you about Herceg Novi, Montenegro. Herceg Novi was the most quirky and the least touristy old town we saw in Montenegro. Although it's small, it felt authentic and like a place where you could have a relaxing day. Fortress Forte Mare is a fun, low-cost activity that's in the heart of the old town. It's an easy-to-get-to fortress that's different from the others and doesn't involve climbing. The views from this fortress are much better than we anticipated. The Kanli-kula fortress is near Fortress Forte Mare and is slightly higher, but we didn't visit. In our defense though, we had just climbed 1,300 stairs to get to the top of the fortress in Kotor! Cost: 2 euros — open until 7:00 pm. Another favorite of ours was going for a stroll through the marina that connected Herceg Novi to our home base, Igalo. This sea-side walk is gorgeous, and the reasonably-priced restaurants and cafes (considering their location) make the whole path feel like a small paradise. Another reason to visit Herceg Novi is that it is the perfect place from which to take a cheap boat tour. We embarked on an 8-hope tour with the Pajo (“duck”) company that took us through Lady of Rock, Kotor, and Perast for only 20 euros — and that included both food and wine! Tours from Kotor started at 30 euros, only lasted half the time and included no food. Saving money is one of the many perks of visiting less touristy places. You can visit their website to get in contact with them, but they lead a tour almost every day during the summer. Additionally, there's a tour that takes you to the Blue Cave, Marmula Island, and the beach for 15 euros; I believe it's a shorter tour and I'm not sure whether they include food. Igalo and Herceg Novi kept us well-fed during our month there. Without having to spend much money at all, we quickly became regulars at some of our favorite places. Here are a couple of food recommendations for when you visit Herceg Novi, Montenegro. Gradska Kafana: For a nice meal with the astonishing views, dine at Gradska Kafana. We probably had our fanciest meal of the year, and we paid 28 euros. The meal at this beautiful location included: a serving of bruschetta, a delicious cut of steak with potatoes and vegetables, an exquisite seafood black risotto dish and a beer and wine. Do-Do: For an ice-cream or an espresso, Do-Do is the place to go. Espressos go for 1 euro, while the ice cream goes for 70 cents per scoop. Nautilus Pizzaria: Nautilus has a seaside restaurant too — but we can only recommend the pizzeria (which you can find at 9 Obala Nikole Kovačevića, Igalo, Montenegro). At the pizzeria, you’ll see an open window where they serve enormous slices of ham and mushroom pizza (seems to be a classic in Montenegro) for 1.50 euro. Do-Do: For ice cream and espressos, refer to our suggestions for Herceg Novi — Do-Do for both! It’s an amazing place for ice-cream, coffee, crepes, waffles… all the good stuff. Bakery Vanilla by Tanja: This bakery is great for pastries and the local favorite “boreks,” which are flaky and savory pastries filled with different ingredients, such as cheese, meat, spinach, or potatoes. Some of our favorite snacks and eats while there included Cevapi, Baklava, Borek. 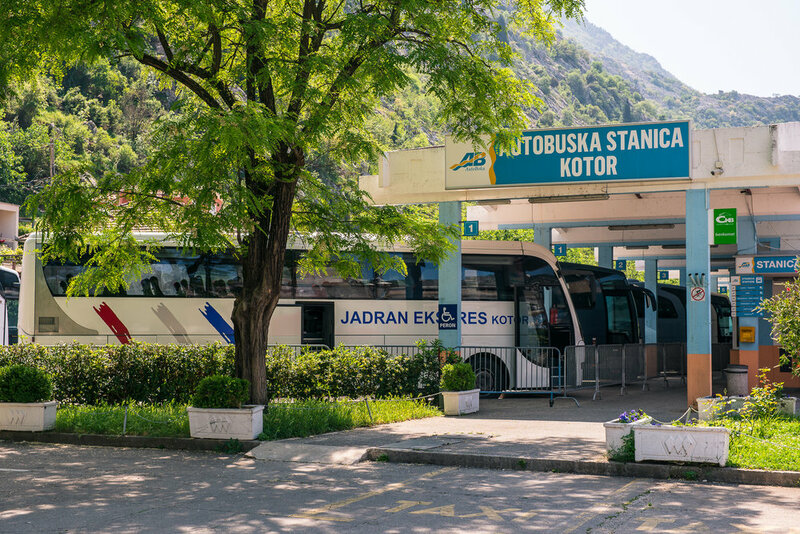 The bus between Kotor and Herceg Novi costs between 2.50 and 4 euros, depending on the company. There is a route that uses the Lepetane-Kamenari ferry to cross the bay, which takes about 45 minutes, and there’s another route that traverses the whole bay, and that takes about an hour and 30 minutes. Since buses don’t appear that often, we suggest you take whichever one shows up first. If it happens to be the longer route, take it — the scenery is stunning. If it’s the shorter one, take that one, as it’s always fun to be on a bus that takes a boat to cross the bay. To go from Herceg Novi to Dubrovnik and vice-versa via bus, visit the following website. The route to Croatia took less than 2 hours and was an efficient way of crossing the border. We did hear, however, that during the summer the lines can be huge and take twice as long, so keep this in mind when you plan your trip. With weather like this, even bus rides serve as nice tours. If you want to spend a few nights in Herceg Novi and Igalo, you can get an extraordinary value on accommodation through Airbnb (it’s what we used), especially if you stay near the beginning of high season. If you use our link, you'll save $40 off your first time using Airbnb! We recommend against going before April because a lot of things are shut down, and the weather is not the most pleasant. We spent the month of April in Igalo, and although some places weren’t quite open yet (they waited till May to do so), the town was lovely.